Welcome to our page showing popular gray living room ideas for traditional, contemporary and modern design styles. Grays for the living room paint color has really enjoyed immense popularity in the contemporary design scene. Despite the ever-changing color trends, gray has enjoyed steady popularity both as an accent color and as a neutral color. 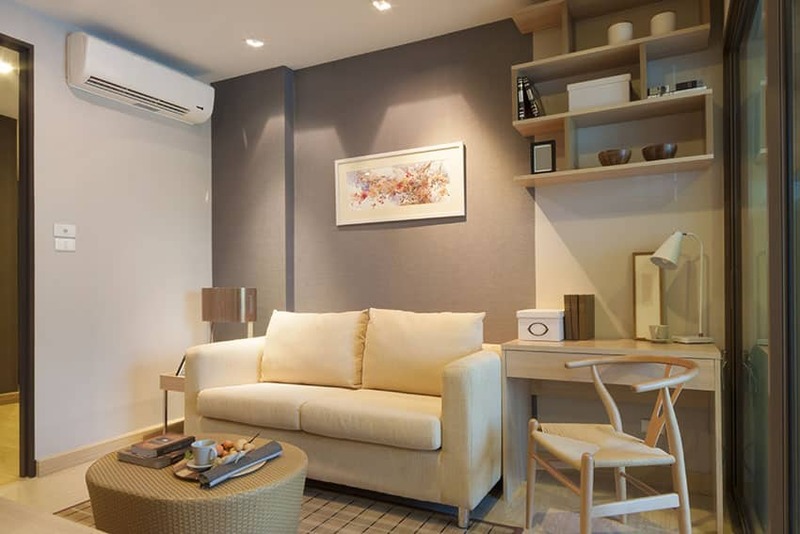 It is often lauded for its versatility and adaptability, giving your spaces a fresh modern feel, while easily blending in with the other colors in the space. 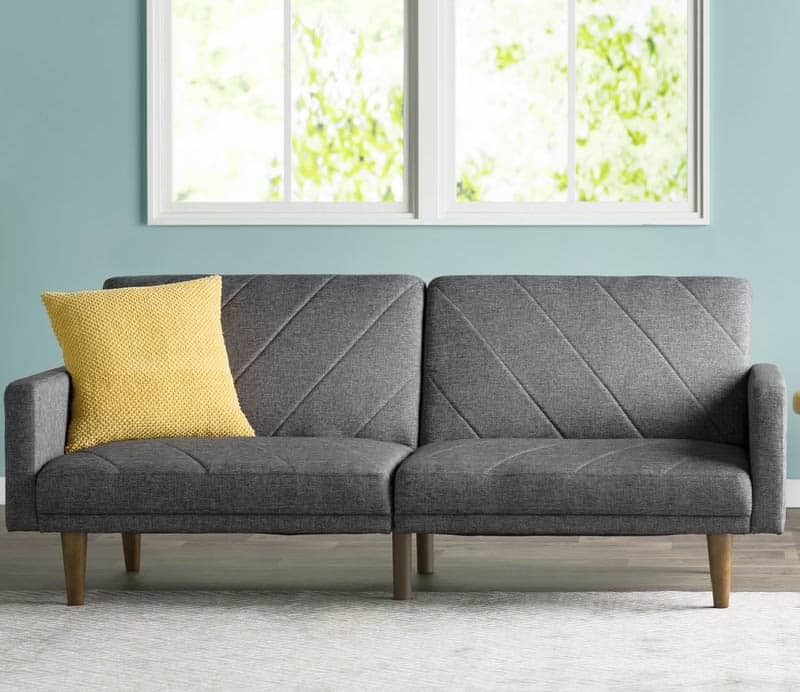 So if you still have that gray wall or modern gray couch from years ago, don’t worry, it’s not getting out of style soon as it becoming a staple basic color. Since gray is a neutral color and is very versatile, it is a great color choice for covering large areas, especially on areas and items which you would like to keep for a long time such as: walls, wallpaper, curtains, flooring and upholstery. These are items we don’t want to replace too often, so it is better if we select neutral colors, making it easy to update the look of your room by just changing the style or colors of your accessories and accent pieces. Use Silver & Metallics – The presence of metallic colors gives a touch of elegance with a modern appeal to any space. The metal foil finish of the wallpaper in the example below gives a more contemporary feel to the classic quatrefoil pattern and instantly gives the Living Room a luxurious feel. By using a refreshing blue color for accent and warm-toned neutrals for the furniture pieces, the ‘cold’ feel of the wallpaper is toned down and is able to give a more homey feel to the space. Play with different shades – Just like the rest of the colors in the spectrum, there are many different shades of gray available. If you intend to use a lot of grays in your living room, make sure you use a variety to create more depth and contrast & avoid making your space look too sombre. Don’t be afraid to experiment. There is very little chance you could go wrong with gray. 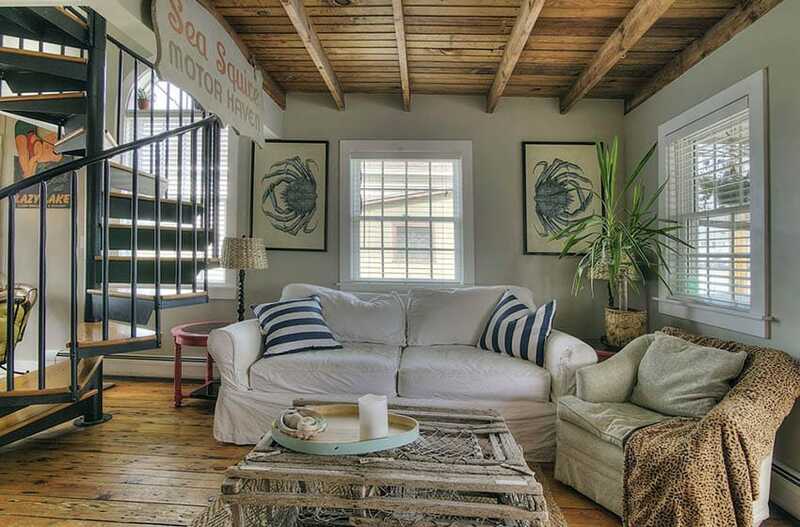 Add an accent – The only danger of using gray is the possibility of making you space feel too boring or cold. A bright or bold accent color can easily solve such concerns. A pop of bright yellow? No problem. Even the most difficult colors to match easily look good when paired with gray, so have fun! This elegant living room design uses a variety of patterns and finishes to make a stylish statement. 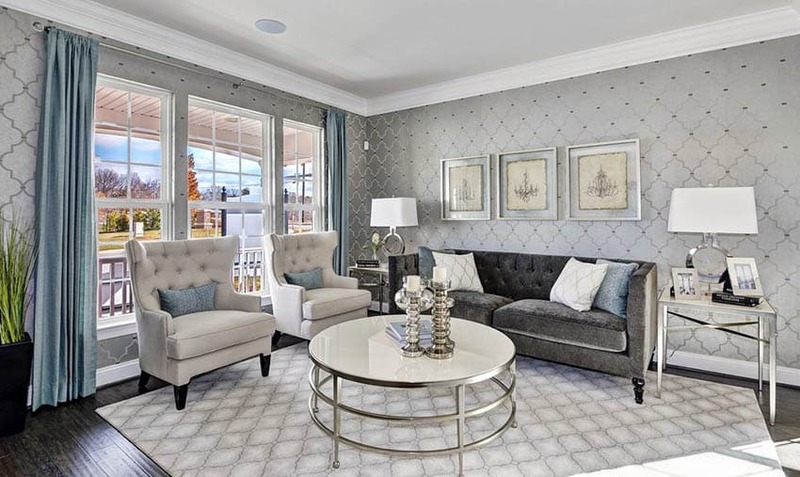 The quatrefoil pattern on found on the wallpaper and the area rug is a classic, but the use of metallic gray/silver instead of a flat color gives it a refreshing update. 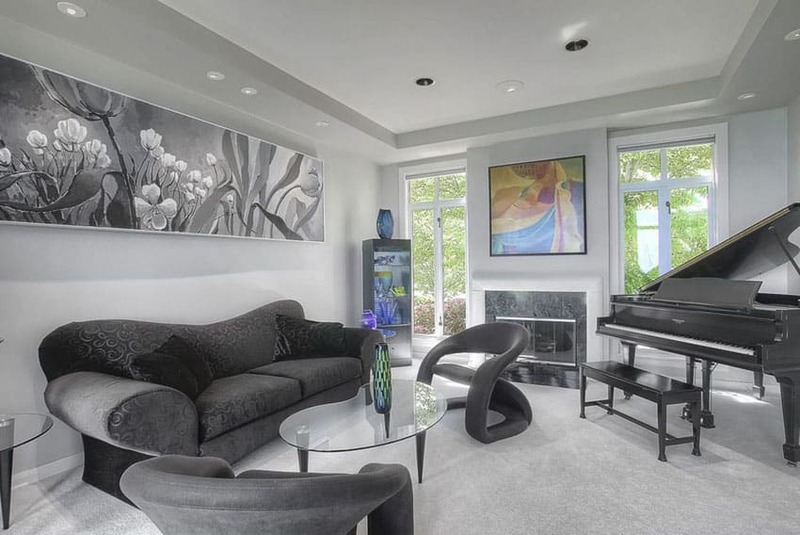 The other elements in this living room also ties with the unique wallpaper, such as the brushed metal legs of the furniture pieces and the chrome finishes accessories. You will also find the same quatrefoil pattern on the pillows and a touch of silver on the picture frames on the wall. A paler, more toned-down gray was used for the walls and the carpet flooring in this living room to contrast with the black furniture pieces and brighten up the space. A few accent accent artwork and accessories in bold and bright colors helps spice up the monochromatic color scheme of the space. This beautiful gray living room with chandelier looks impressive with is pairing or gray paint and white molding. Dove gray is one of the most popular gray shades used as wall color because of its versatility. It is neither too dark or too light, and adds just a the right amount of contemporary appeal to any space you use it into. 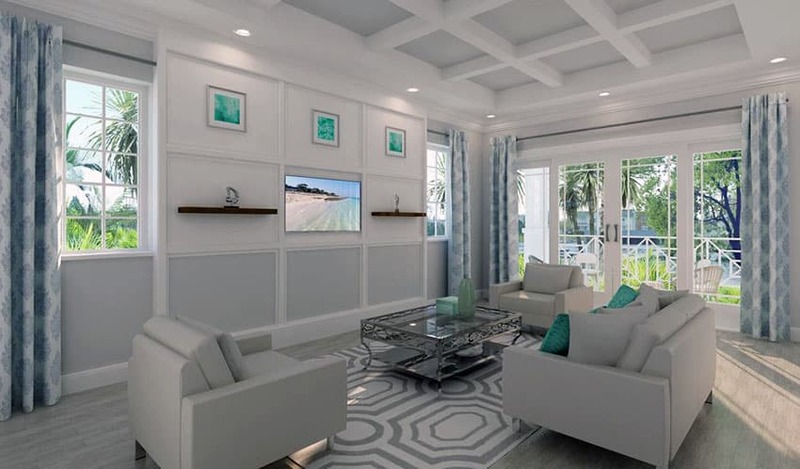 In the example above, you will see that the living room uses furniture pieces in cream and navy blue, with nailhead details and classic silhouettes. 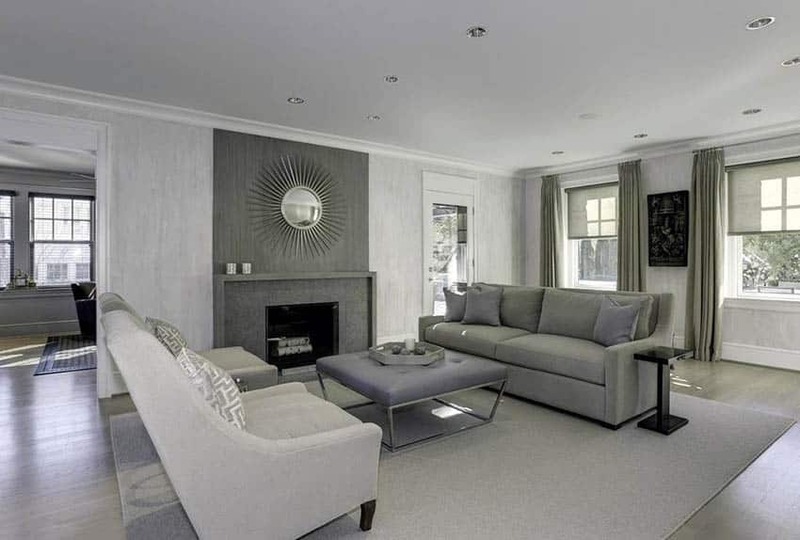 The very classic style was given an update with its dove gray walls, paired with the white wall paneling and trims. If you want a more cozy and relaxed living room design, try using darker grays for a more subdued and moody ambiance. 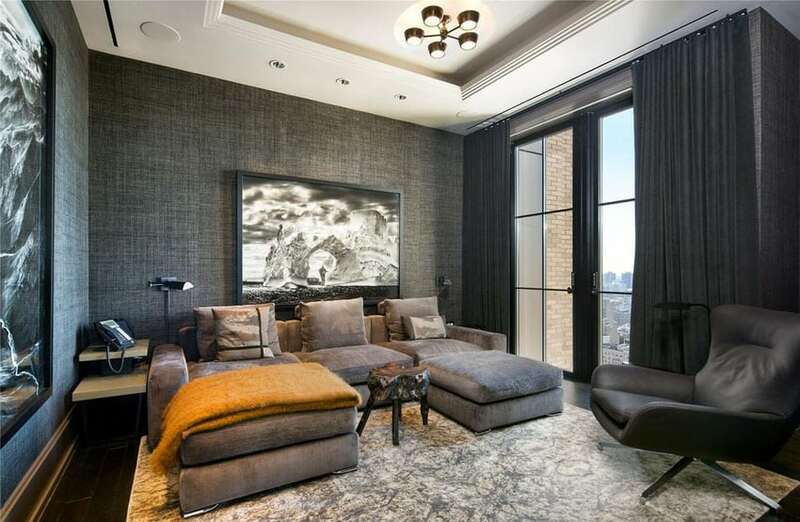 This small living area uses linen-textured wallpaper in dark gray, giving the room a mysterious yet elegant ambiance. Wallpaper – wallpaper is quite expensive, so when selecting one, always consider the longevity of its design and color. Gray is a fail-proof choice for wallpapers as it can easily blend in with other colors. Do try wallpapers with textures such as linen/fabric wallpapers or woven wallpapers, to help add more dimension to the surface. Metals – it is easy to find metal accessories and furniture pieces. You can go for chrome finishes, brushed stainless steel, or even painted gray finishes. Pale gray works just as well as pure whites when it comes to brightening spaces, but it has a bit more personality than the usual pure white. 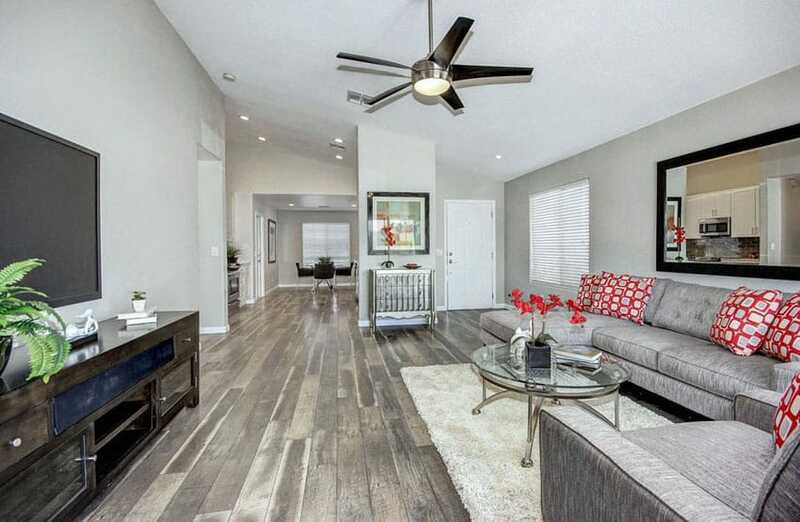 The gray walls also works well with the rustic living room wood flooring and furniture pieces in the room. 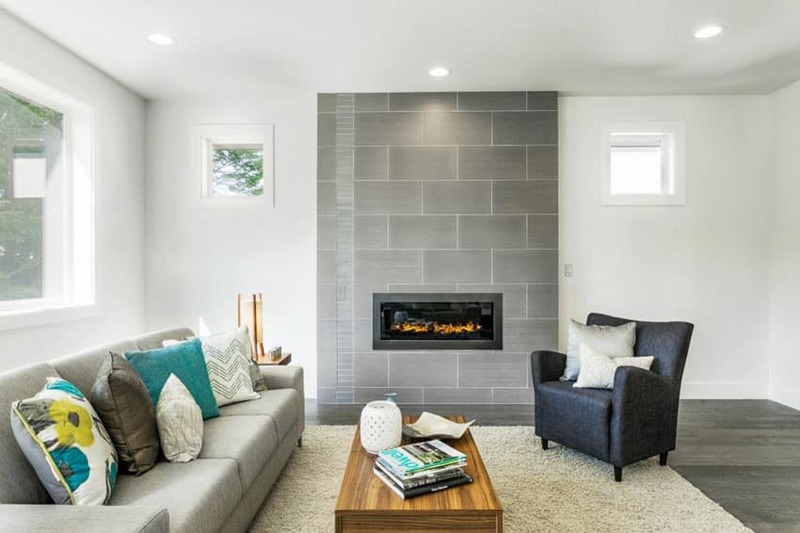 Aside from furniture upholstery and wall paint or wallpaper, you can also use gray-colored natural materials like the accent wall in this living room which uses natural gray slate stone cladding to add texture and color depth to its surface. To match with the warm color scheme of the living room, the gray upholstery of the accent lounge and armchairs has a warm undertone as well, making it blend with the other chocolate-toned pieces in the room. Upholstery – Big and expensive furniture pieces such as sofas are something we usually intend to keep for as long as we can, so using a neutral color for its upholstery will save you a lot of money versus constantly reupholstering to the currently trendy color. Paint it gray – one of the cheapest ways to add a touch of gray to your living area is to paint it. Go for light, soft grays to create a light a refreshing vibe, or go for warmer grays like the example above for a more cozy feel. You can also use gray to paint furniture or other accessories in the living room. Curtains and pillows are another easy alternative is to use grays on your curtains or the throw pillows. This will work even if your furniture or your walls uses bolder/brighter colors. 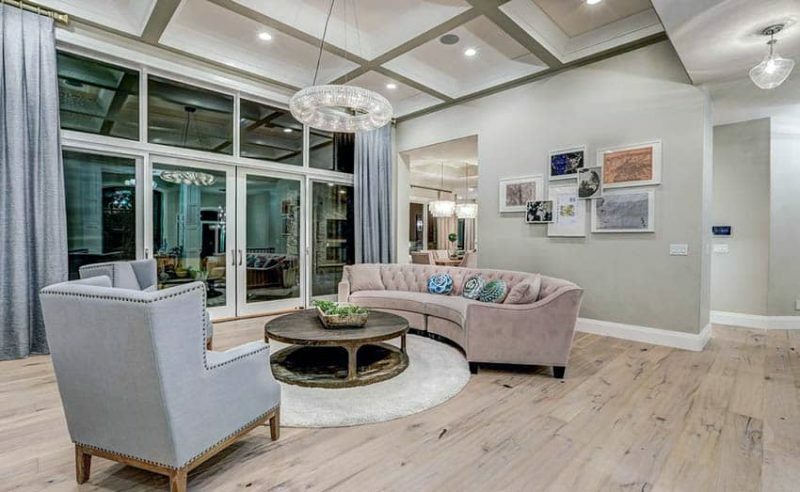 This living room space makes a central sitting area around its large gray area rug. 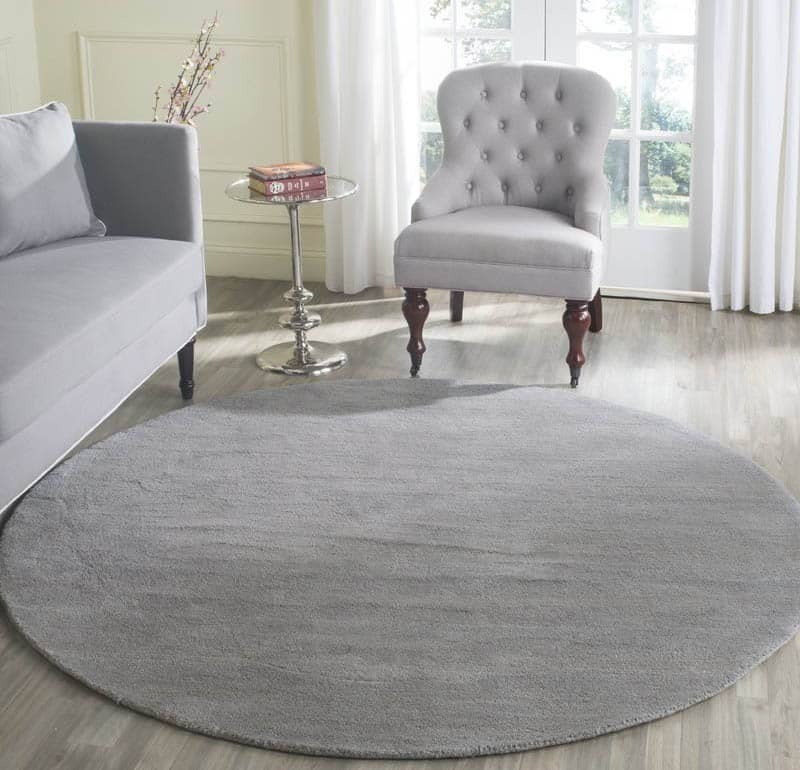 These types of rugs are great for designating a seating area as well as unifying functional zones in the home. You don’t have to cover a large amount of area in gray. Like in this example, only a small portion of the wall was covered in gray wallpaper to add a cool tone to the otherwise warm color palette of this small living area. By simply adding gray tiles on the center of the wall, this contemporary living room is already given more appeal and texture versus keeping it plainly white. Accent wall – you can also use gray as an accent wall, by using paint, wallpaper, tiles or even natural stones. Grays also look good combined with color schemes using the colors taupe, beige, creams and browns, as it helps add a touch of cool tone to the warm palette. 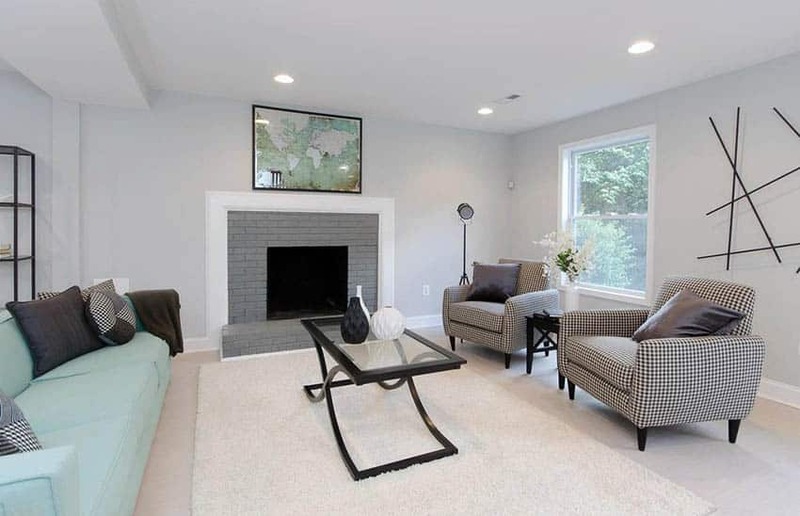 A gray painted brick fireplace can be an interesting way to bring this color in to your living room design. Since one of the things that dates a room is its fireplace, painting it can be a great way to update the room and create a new look. 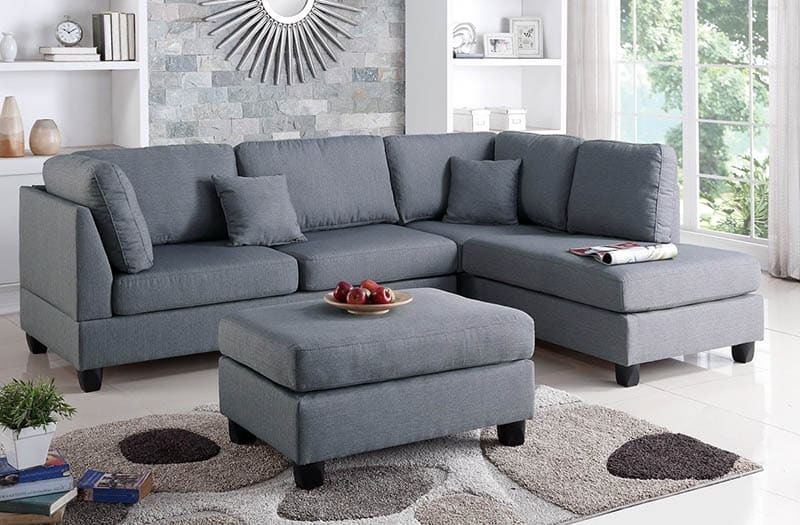 This contemporary sofa in gray upholstery would look good in any living room, given its neutral colored upholstery. You can easily accessorize it with colorful pillows to match the color scheme of your choice. 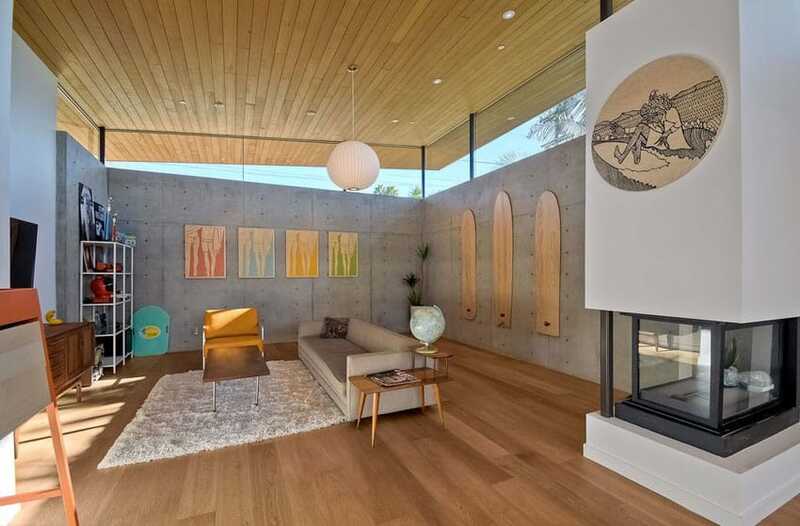 Concrete – concrete is a trendy material commonly used in contemporary designs, most especially on industrial style interiors. Concrete finishes adds a rough and rugged look to your living space and an industrial gray look that can be adorned with colorful decor to add your own personal touch. 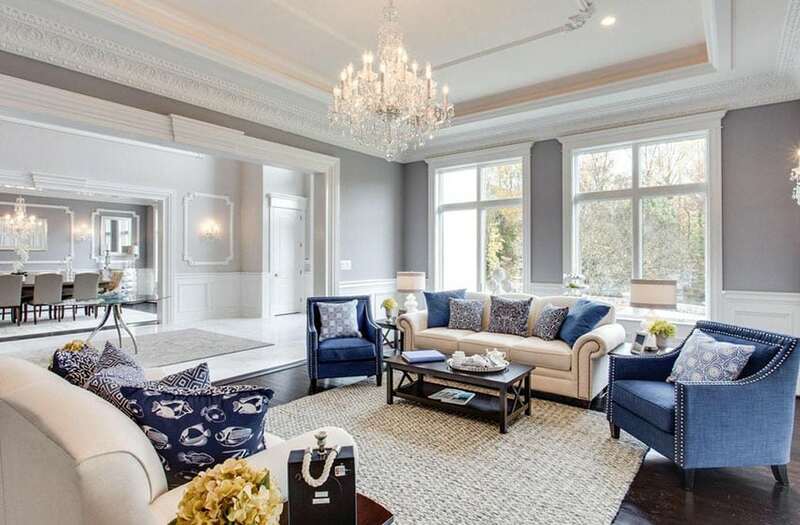 This grand living room uses a variety of grays combined with touches of color to create a glamorous design. Dark gray furniture and curtains combined with light gray wall paint gives this space an alluring look. When it comes to finding gray living room ideas the sky’s the limit to the possibilities. Gray is an easy color to work with, so don’t be afraid and have fun with it. 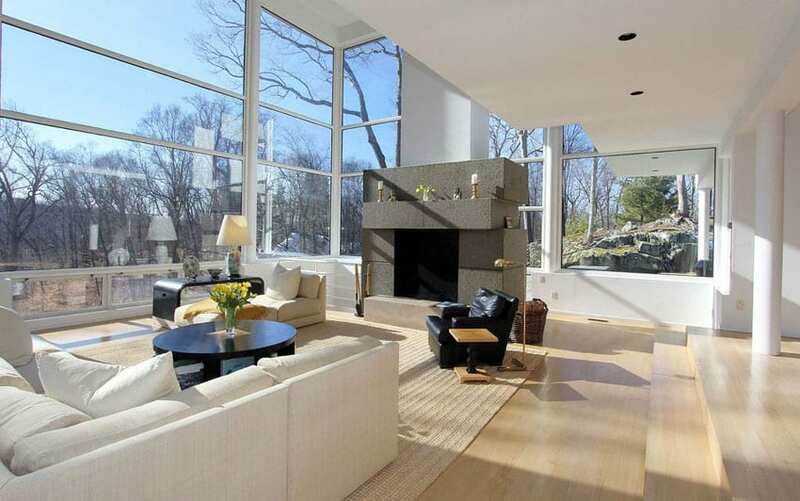 For more pictures take a look at our contemporary living room ideas gallery here.